If you've never heard of Street Fighter II then you must be looking at the wrong website - perhaps you typed in 'Sega' instead of 'Saga' while you were looking for your car insurance or something. No matter! You are here now, so I'll break it down from the very start! Street Fighter II was one of the most successful Coin-op arcade games of all time as the perms and shoulder pads of the '80's turned into the mullets and glow sticks of the early '90's! 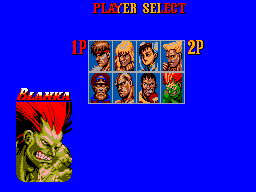 Groups of shell suit clad children and teenagers would gather round the screen at the local arcade or leisure centre, and marvel at the cartoon like fighters as one especially skilled child might make it to the fourth or fifth round before being beaten by Dhalsim's bendy and stretchy legs or Blanka's annoying constant electric shock! Basically, Street Fighter II is the grand-daddy of all one-on-one fighting games, and we never thought it would ever make it to the Master System back in the day - most of us collectors didn't even know that Tec Toy had developed a version for our favourite console and released it in Brazil until we came back to the system, collecting using the 'inter-network' we now all enjoy many years later - and some of the more general fans of the system might not even have known of the existence of the game until you started reading this here review! Question is, could something this daring really be pulled off? Straight forward, beat your opponent up in order to progress through the tournament. One on one you can play against the CPU or another human player. 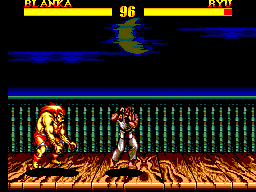 The animation of the players has definitely lost some frames in comparison with the 16-bit versions released some years earlier. However surely that was to be expected, and the game still flows pretty well. There is no noticeable dodgy collision detection that I can find, and most of the players original special moves have remained, being executed fairly easily. The easy mode is pretty easy, and the hard mode makes it near impossible to get past around the third or fourth round without some SERIOUS practice (And I am pretty much a master of fighting games, so trust me - it is hard!!). Overall, there are no major flaws, and nothing that causes frustration. Problem is - the game just doesn't seem quite as fun as either the arcade or the Megadrive version. It's fun, especially in two player mode, but that's about the best way to describe it! Ok, there is an amusing thing here. At the start of each round, look at your sprite and your opponent, and spot the gap between their shadows and their feet! Basically, it appears as though each player is levitating in that fake David Blaine type way!! But that's pretty minor and just a little funny. Overall the sprites are a good size, very colourful and animated pretty well. As discussed in the Gameplay section above - there are not as many frames to the animation, but it all moves smoothly and quickly enough, no glitches and no slowdown. All of the foreground graphics are very colourful and bold, all recreated very well indeed. The backgrounds on the other hand range from very good when fighting Chun-Li, to ok when fighting Ken, to non-existent when fighting Ryu. I found the backgrounds graphics almost frustrating - honestly, it nagged me that much! Chun-Li's home background really is very detailed and bares comparison pretty well to other versions of the game! But then you go to Ryu and there is just nothing! It's like the programmers started off with fantastic intentions and effort and as time went on just said - "meh, that'll do, it's 1997 and nobody cares about the Master System any more!" Maybe I'm just being picky though, because the lack of detail in the backgrounds of course does not affect the relatively good gameplay. Once again, the programmers seem to have fallen into the old trap of trying to directly copy the arcade tunes to the Master Systems rather underpowered sound chip. And once again, it just doesn't work. The music comes across as rather feeble and pathetic, and could definitely have been done better with a bit more imagination and effort. It doesn't add to the atmosphere, although to be fair it does not offend or grate on your nerves too much. The one saving grace is the speech, which although having lost many phrases and effects in translation is still crisp and clear when it is utilised. The controls are surprisingly responsive, and the programmers opted for the tried and tested 'button 1' to punch and 'button 2' to kick. If you've played the much more common game Mortal Kombat, or its sequel (both of which I have previously reviewed - sorry for the shameless plug! ), you'll have the controls mastered in no time as they are essentially identical. You can execute multiple combinations and once played for a while you'll master hitting someone in the air three or four times before they drop to the ground! If you're not too skilled at mastering special moves, then the good old button mash will do too! Very good controls that I cannot fault. There will always be that novelty value in playing this game of "hey, it's Street Fighter II, and it's for my Master System! ", because being honest, none of us had it during our original collecting days in the '90's. (Shut it Bock, we know you probably had a spy in Brazil, but you're the exception!!!!). Other than that, it is an average to good fighting game which you can complete on easy in an hour or two, but playing on hard could keep you occupied for a long time! Personally, I'm still yet to finish the hard mode! Obviously, two player will always have good appeal. Ok, the problem here is that the game just isn't as good as any other version of the game! But then it really doesn't have any right to be, since it is the only official version (pirates aside!) that was released on a full size 8-bit console. Some of the best players are missing from this conversion including Dhalsim and Eddie Honda (the hundred hand slap was the best!). Please don't take any of that the wrong way though! 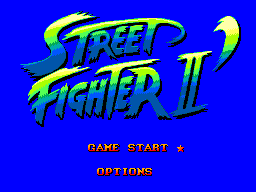 Had they changed the title and altered some of the sprites a bit I probably would be saying it was a good fighting game but carrying the Street Fighter II name on its back is a pretty heavy load. Had the game been released in 1993, I have no doubt I would have been raving about it, but by 1997 I suppose maybe I just would've expected a little more. The game overall is very playable, is animated pretty well and is a reasonable conversion. If you're a true collector get it for the novelty value and to take out at parties to say to your guests - "I bet you didn't know they released THIS for the Master System! ", but don't let them play it, switch it for the Megadrive whilst their backs are turned before you turn it on!